Please join us for our next Business to Business Luncheon scheduled for Wednesday, April 10th at 11:30 AM at the Springfield Area Community Center. Please RSVP to the Chamber office by Wednesday, April 3rd at spfdchamber@newulmtel.net or (507) 723-3508. 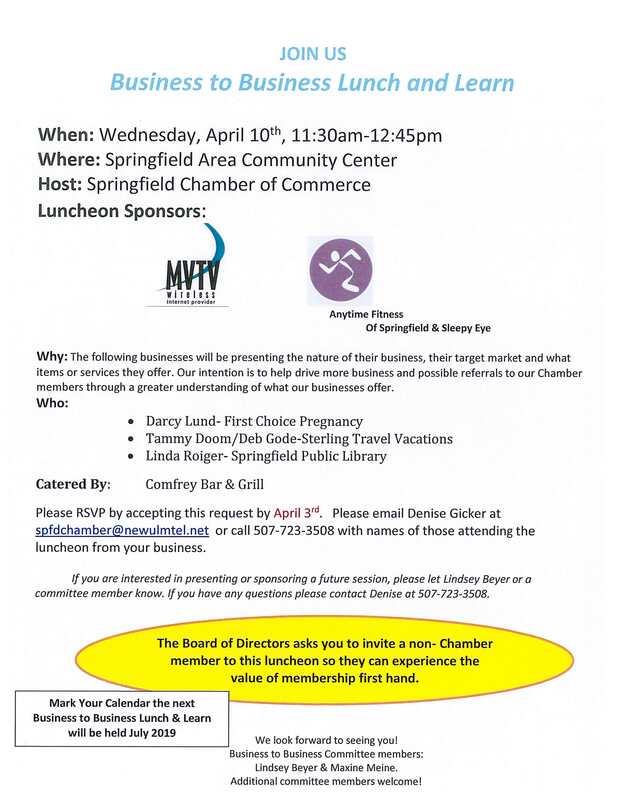 Our speakers are Darcy Lund of First Choice Pregnancy Services, Tammy Doom/Deb Gode of Sterling Travel Vacations and Linda Roiger of theSpringfield Public Library. The luncheon will be catered by the Comfrey Bar & Grill and our luncheon sponsors are MVTV Wireless – Broadband Internetand Anytime Fitness of Springfield MN.